When we want to watch some videos, the first idea that would come to our mind is going to YouTube. Indeed, YouTube has been the first choice of online video viewing for so many people all around the world. From comedy to cooking tutorial, from product review to movie trailer, everyone can find the kind of video he or she loves in YouTube. Since there are so many interesting videos in YouTube, I believe you have thought about downloading some videos from YouTube to local for later viewing, editing or sharing. However, YouTube does not provide a download portal for us to directly download videos from it. In order to download videos from YouTube, we need the help of some video downloader tools or online downloader websites. Some of the downloaders can provide a stable and high download speed while retain the quality of the video, and others would compromise either the downloading speed or the video quality. So, what is the best YouTube video downloader? We have handpicked some of the best YouTube video downloaders today you that you can make the best decision for yourself. For the first part, we are going to see some of the best YouTube video downloader programs. These are professional video downloaders that requires an installation. Once you have downloaded and installed the downloader program, you will usually get a stable download from the program. Now let’s take a look at the best YouTube downloader programs. Even though it’s named a “downloader”, Leawo YouTube Downloader acts far more than a single online video downloader. It can not only download YouTube videos and other online videos from various video sharing sites like Facebook, Dailymotion, AOL, iFilm, Myspace, Dailymotion, etc., but also acts as video download accelerator to speed up online video downloading and video buffering for smooth playback. In addition, Leawo YouTube Downloader can also serve as a video player to play back videos, and IE browser to browse online videos for free downloading. It could extract audios out of online videos, like converting YouTube video to MP3. With Leawo YouTube Downloader, watching online videos offline anytime anywhere is just a piece of cake. It’s extreamly easy to download videos using Leawo Video Downloader. Here are the detailed steps of how to do it. Step 1: Locate videos. Open the Leawo prof. media program and you will find the “Video Downloader” in the main interface. Click it and then open the Leawo Video Downloader, in which you can paste the video URL in the address box. Step 2: Load video to the Queue. After entering the website you need to call out the wait-to-select panel by clicking the green arrow on the right side. Then choose the one with the right resolution you want and click the download icon. Step 3: Download videos. Finally, what you need to do is clicking the green “Download” button. After that Leawo Video Downloader will begin to download the video you have chosen. 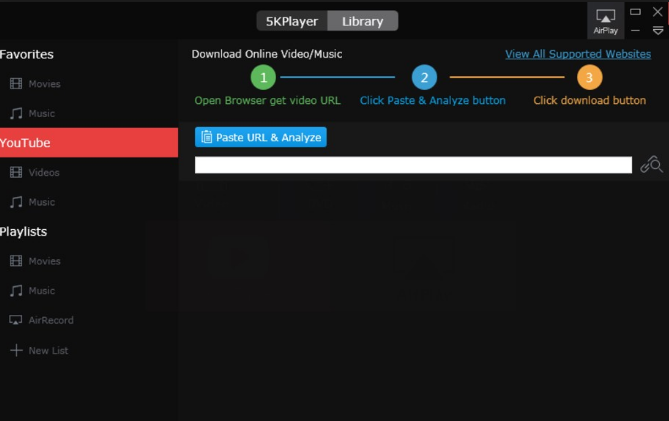 On 5KPlayer’s official website, you will find a comprehensive list of guides regarding how to download online videos from some of the major sites including YouTube (Vevo), Facebook, Dailymotion and Vimeo. SMPlayer is a free media player for Windows and Linux with built-in codecs that can play virtually all video and audio formats. It doesn’t need any external codecs. Just install SMPlayer and you’ll be able to play all formats without the hassle to find and install codec packs. SMPlayer offers YouTube support that lets you play videos right away from YouTube. To play a YouTube video, just select YouTube browser in the Options menu. That will open the YouTube browser window. This tool allows you to browse among the most popular, most viewed and most rated videos. You can search for a video typing a term in the search field at the bottom of the window. To play a video, just double click on it. 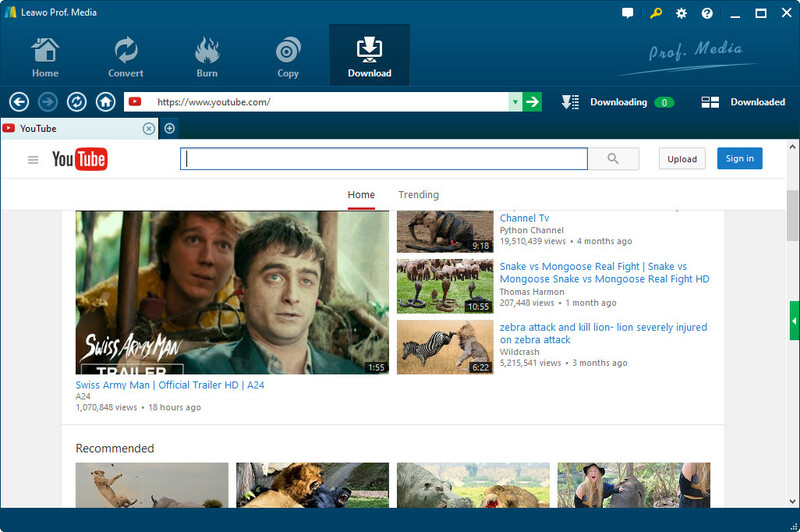 Although SMPlayer is a player program, it can also manage downloading videos from YouTube. For the second part, we are going to see some online YouTube downloaders. Comparing to the professional YouTube downloaders introduced in the last part, these online YouTube downloaders has an advantage: You can directly download your video without installing any additional programs. However, the disadvantage of this method is also obvious, the download speed is not promising, as it depends on the download ability of your web browser. And the video quality is usually not high, you might get a compressed video after downloading. Also, the format of the downloaded file is sometimes not selectable. But if you only want to download a video, don’t care about the speed or quality very much, online YouTube downloaders are still good tools for you. Now let’s take a look at the best online YouTube downloaders. QDownloader.net ia an online video downloader website that claimes to support More than 800 Websites including YouTube, Instagram, Fasebook and more. It provides video download in MP4, 3GP and WEBM format. Like most of the online video downloader tools, to download a video, you only need to copy and paste the URL of the video to the box and hit the “Download” button. Once you hit the download button, the website will list all the selectable video formats and sizes for you to choose. Normally you have the options of 720P to 144P for tha quality, and MP4, 3GP, WEBM for the format. You can also choose to download a video with sound or without sound. Once you have found the best option, click the download button to download. The website also works on mobiles so that you can download your YouTube on your phones as well. SaveMedia’s full neme is SaveMedia YouTube downloader and MP3 Converter. As it’s name suggests, the website provides not only Downloads from YouTube, but also MO3 conversion from videos. The website features the functions of Downloading YouTube videos up to HD resolution, converting videos to MP3/WebM audio with a single click, unlimited free conversions and downloads, no additional software required and being compatible with mobile phones. The website also provide MP4, WEBM, 3GP formats for video with or without sound, and the MP3 download function works only on YouTube videos. What ever YouTube downloader you choose, I believe it’s not hart to download your beloved videos from YouTube once you have found the right tool to help you. One problem you might encounter after you have downloaded the YouTube video is, the format of the video is not what you want. As mentioned earlier, although most professional YouTube downloaders allow you choose the output format of the downloaded video, some of the online video downloaders don’t provide the function. So, what if you have downloaded a video but the format is not what you need? Well, there is a solution for you to solve that problem. Leawo Video Converter is the perfect solution under this circumstance. Leawo Video Converter is one of the best video and audio converters. 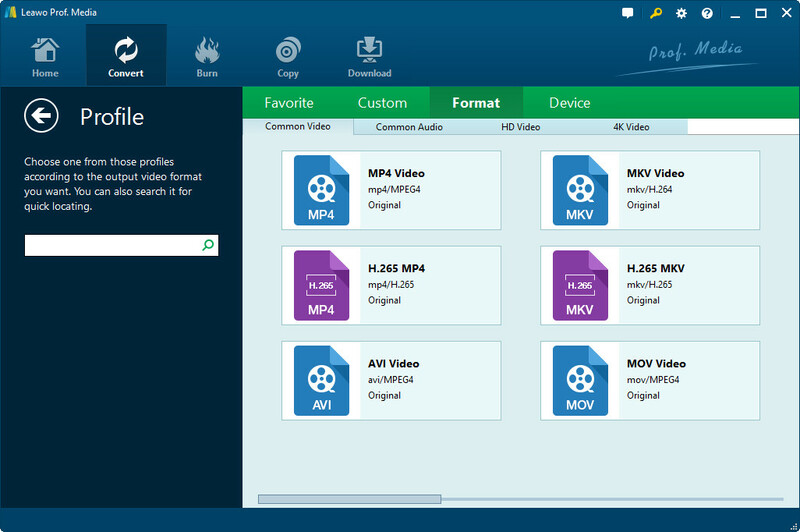 It allows users to convert video and audio files contained in more than 180 formats from one to another, such as MP4 to AVI, MOV to MKV, MTS to FLV, WMV and so on. Besides, this Video Converter can also empowers users to convert videos to iPhone, iPad and all portable devices. With 100% quality reserved and in 6X faster speed, this professional video converter software is capable of keeping source quality in faster speed than other software. Here is how to convert your video to any format with Leawo Video Converter. Step 1: Add source files. Launch Leawo Video Converter and open the “Convert” tab. click the “Add Video” button to browse and add source files to Leawo Video Converter. Step 2: Set output format. Right next to the “Add Photo” button, click the drop-down button right and then choose “Change” option to enter the “Profile” panel. Open “Format > 4K Video” group to choose either 4K MP4 Video or 4K MKV Video as output format. Step 3: Set output directory. After setting output format, go back to the main interface and click the big green “Convert” button. Set output directory in the “Save to” box on the popup sidebar. Step 4: Convert H.264 to H.265. Finally, click the bottom “Convert” button to start to convert H.264 to H.265. You could view the whole converting process on the converting panel. Now that you have downloaded your video from YouTube, the next step is to play it. If the video you have downloaded is not the format you were expecting, besides converting it to another format, in order to play it, there is another choice, which is to use a universal video player that can play all kinds of vide format. Such a video player is rare, as most of the video players can only play limited numbers of video format without additional video codec installed. But there is one video that I would strongly recommend. I can play not only all kinds of video format, but also DVD/Blu-ray disc, ISO image and folder. The universal video player program is called Leawo Blu-ray Player. With advanced image and audio processing technology, Leawo Blu-ray Player could provide you quality-lossless image for even 4K video, stereo audio enjoyment, all regions free DVD decryption and user-oriented playback control so that you can play any high-quality movie and play Blu-ray or DVD across region. Furthermore, within Leawo Blu-ray Player, you could obtain the personalized settings according to your preference and all the settings could be done automatically. The instructions for playing are quite easy.